Southern Utah University’s master of public administration (MPA) online student Matthew Rutkowski recently wrote and received approval for a $10,000 grant that will financially benefit underrepresented students in Texas. 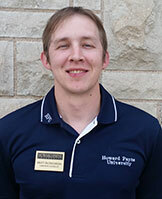 Rutkowski, an admissions counselor with Howard Payne University (El Paso Center), works to support prospective and current students in the border region. Financial concerns are a large barrier for many students and this generous grant will help underprivileged students in the El Paso area be able to pursue their higher education aspirations. The majority of students at Howard Payne pay for their education through financial aid. Financial concerns and struggles often dictate whether or not a student can pursue/complete their college studies. Based on this knowledge, Rutkowski decided to take the initiative to write a grant to alleviate some of these worries and create new opportunities. To receive this scholarship, students are required fill out an application in addition to the FAFSA. Rutkowski completed this project for his MPA professional project with the support and encouragement of MPA Director Dr. Angela Pool-Funai. He also worked closely with Karina Daniel (Howard Payne development team) and Dr. Adrian Gil (Howard Payne Extension Center Director) during this two month long process. The steps Rutkowski took to write the grant included researching a foundation to approach, drafting and revising the application, and submitting the application for approval. Rutkowski is native to El Paso, Texas and set to graduate from SUU this December 2018. He was initially drawn to SUU because of the unique MPA degree. He was looking for NASPAA accreditation, affordability, strong program outcomes, and quality professors. He found that SUU was the only university which met all his expectations. SUU's master of public administration degree can be completed on-campus or 100% online. Recently SUU was ranked in the 2019 Most Affordable Online Colleges for MPA. This program gives students valuable experience in public sector work and can pave the way for municipal, state, and federal employment. Career opportunities for individuals with an MPA may include federal/state/local government, higher education administration, HR management, law enforcement administration, management consulting, or non-profit management. These career paths provide many substantially different opportunities and can make a difference in local and global communities. Learn more about SUU’s MPA program.